Outside of a dog, a book is a man's best friend. Inside of a dog, it is too dark to read. I would not join any club that would have someone like me for a member. Those are my principles. If you don't like them I have others. Television is where you watch people in your living room that you would not want near your house. Only one man in a thousand is a leader of men. The other 999 follow women. All I know about humor is that I don't know anything about it. I could dance with you until the cows come home. On second thought I'd rather dance with the cows until you come home. A physician's physiology has much the same relation to his power of healing as a cleric's divinity has to his power of influencing conduct. 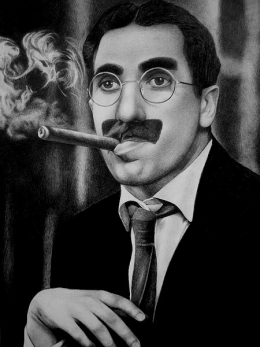 29 quotes by Groucho Marx.